content, fluorescence and detect nutrition deficiency. This project was created on 06/01/2017 and last updated 2 years ago. however, use antiquated techniques which lead to overuse or under usage of fertiliser,water which leads to disastrous yields. Our solution to this problem is “FarmCorder” system. appropriate fertilizer advice is provided over IVRS. 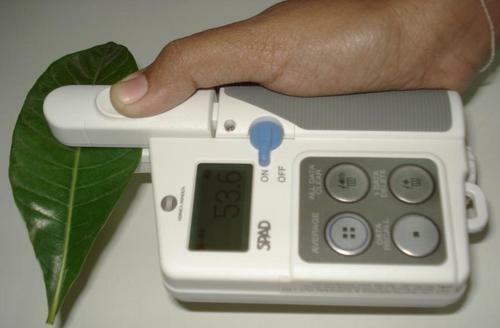 It was a handheld device with a clip like apparatus which could be used to identify the signs of nutrient deficiency by non destructively sensing the leaf&apos;s chlorophyll concentration. Upon using the SPAD meter myself I was able to realize the fundamental flaw with it, The SPAD meter was exclusively designed for use by researchers and scientists. It did not need to be used by a farmer, The SPAD meter outputted the SPAD value which needed to be interpreted for the particular crop variety to identify and quantify nutrient deficiency and a regular farmer would lack those tools. The leaf color chart was made by the International Rice Research Institute to help farmers make smarter decisions during fertilizer application, It however was hurdled by it&apos;s flaws leading to it&apos;s absense from farmers toolkit. My goal was now set, I wanted FarmCorder to be a device that would be accurate like the SPAD meter while being inexpensive and provide farmers with actionable data about their crop while being easy to interpret. Here is a sketch of our proposed design, The device would be a rugged chunky device with a low power display and large battery with wireless connectivity and GPS. The farmer would periodically go around the feild and sample various leafs of the crop, All this data is stored with a time&location stamp from the GPS device. This makes it possible for multiple farmers to share the same device using geofencing of their farm land. The measurements are to be taken twice a week. The data goes to a cloud server where the data is compared with a nominal database for the same crop varitey along with the date from sowing. The divergence in leaf chlorophyll is extracted from the mean statistic and thus using a detailed fertilizer application plan is obtained and this along with a local weather reported is provided to the farmer using Interative Voice Response (IVRS) on his normal phone in the farmer&apos;s local language. The farmer would thus be able to correct any crop nutrition problems in the start. FarmCorder inital firmware for Particle boards. Kindly refer to the github page for details. 3d printed enclosure for device. When I started off, I started by analyzing the existing SPAD meter and read through some research papers. Where upon I understood the basic principle of a SPAD meter and components involved. My initial schematic involved getting a seperate large surface photodiode and custom amplifiers and filters along with LED&apos;s. This just increased my cost by a considerable amount causing me to search for an other option. I was thus led to the amazing TSL2561 IC by AMS. The TSL2561 was a highly sensitive and accurate irriddance sensor which was used in smart phones to measure ambient lighting condition. It has in inbuilt amplifier, filter and high resolution ADC and outputs over i2c. The best part is that it works on both visible and infrared rad. The i2c sensor is also helpful for making the device more modular in design for adding new sensors. The two LED&apos;s used in the prototype are 650nm and 940nm and I&apos;ve forked the Adafruit TSL2561 board design to create a custom one with LED&apos;s and driving circuit for the same. The LED&apos;s are to be controlled by PWM. You can get your&apos;s on OSHPARK. We have chosen the Particle Electron to be center of our project connected to various peripherals like a GPS module, OLED. The device has two external JST connectors to connect the Leaf Chlorophyll clip sensor and a soil moisture sensor probe. Nitrogen is an essential element for plant growth and development. It is a major component of chlorophyll in plant leaves. Chlorophyll levels affect leaf area, leaf weight, plant size, and transpiration rate. Too little nitrogen can cause nitrogen deficiency symptoms affecting plant quality, pro- ductivity, and salability. Too much nitrogen is not good either, as nitrogen toxicity can occur in overfertilized plants, leading to stunted growth and a poor quality plant. Overfertilizing can be a source of unnecessary extra costs as well as an environmental hazard in the case of nutrient runoff. The SPAD meter works by emitting two frequencies of light, one at a wavelength of 650 nm (red) and one at 940 nm (infrared). Leaf chlorophyll absorbs red light but not infrared, the difference in absorption is measured by the meter and termed SPAD. Therefore, the unit of measurement is SPAD, a ratio that is provided by the meter. The value does not give an actual chlorophyll or nitrate count Rather than saying, “there is this number of chlorophyll,” the meter value can be interpreted as, “this is a ratio of reflection vs. absorption.” The infrared absorbance is used to account for the leaf thickness. Additionally, plants cease to create chlorophyll once a certain threshold has been reached. Consequently, the meter cannot indicate an abundance of nitrate, only a possible deficiency. In terms of estimating nitrate content, the measured value is most useful when compared to a well fertilized control group. The researcher in the facility showed me a tool which he said was capable of identifying the nutrient deficiency in various crop. It was the Konica Miltona SPAD-502 meter. It was late summer in my hometown and I visited my dad&apos;s village farm during my university break, I found my dad to be perplexed in the field jotting down something on his notebook. Upon inquiry I learned that it was time for fertilizer application in his rice crop and that he was finding it difficult to find out how much fertilizer to apply for his crop. I had heard of the recent surge in fertilizer cost but I was surprised to hear that it was causing him quite a bit of capital investment and that the amount had to spot on. I found the problem to be a bit odd and I wondered if anyone had come up with a solution to solve this rather giant problem. A visit to a nearby Agriculture research facility made me realize the magnitude of the problem and the wide array of farmers whose very livelihood was affected by the same. This sort of inspired me to come up with a solution to make not only my dad&apos;s job easy but also aid all small farmers in developing nations. Hi, we have tremendous problems with nitrates in well water due to overfertilization. I do not get the relationship between nitrogen / nitrate concentration in leafs and chlorophyll. Chlorophyll vs. spectrum can be researched in papers, however it is more difficult to relate chlorophyll with available nitrogen in the plant and possibly soil? My understanding is limited to spectra and reflectance of light from canopy. Could you point me in the right direction? What is the state of your prototype currently? Thank you! Great Project ! Could you provide more info on you soil moisture sensor. I used a dielectric based soil moisture sensor, https://www.dfrobot.com/product-1385.html. It&apos;s pretty accurate. If you are measuring 650nm and 940nm you can get pre-made i2c modules indented for pulse oximetry in smart watches like MAX30102 for cheap on ebay etc. Awesome idea. Did you check how the readings fluctuate with temperature? You are about to report the project "FarmCorder: Crop nutrition deficiency sensor", please tell us the reason.